Marvel Studio’s “Ant-Man” is a reminder that there can be superhero movies that don’t involve immense world-saving heroics. It’s also a reminder that such a movie can be kind of choppy with an unoriginal screenplay and in need of a director a little more creative than Peyton Reed (“Bring It On” and “Down with Love”) and yet still be an entertaining, enjoyable viewing experience that’s different enough from the usual entries we’ve grown accustomed to in the Marvel Cinematic Universe. It’s not a giant-size extravaganza, but it proves that a little-known second-tier can provide a fun breather from all the bombastic “events” viewers associate with superhero movies. 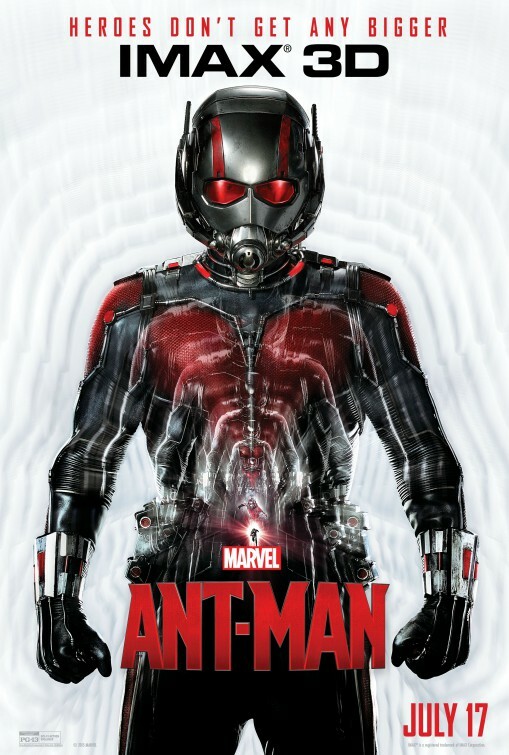 Recently paroled cat-burglar, Scott Lang (Paul Rudd) is ready to hold down a steady job and provide for his young daughter, Cassie (Abby Ryder Fortson), who’s being raised by her mother (Judy Greer, playing a slightly better mom than the one she portrayed in “Jurassic World”) and her San Francisco cop (Bobby Cannavale) fiance. That seems an impossibility due to his record, despite his crimes being more of the non-violent variety and Lang soon finds himself hooking up with his former cellmate bro, Luis (Michael Peña), who has a tip on a local mansion that has something worth stealing. Desperate to provide child support and stand on his own two feet, Lang joins Luis and his two pals, hacker Kurt (David Dastmalchian) and driver Dave (Tip “T.I.” Harris) as they hatch a scheme to steal a mysterious fortune. That fortune winds up being a strange suit and helmet, which Lang dismisses until he haphazardly learns that the suit provides the wearer with the ability to shrink down to the size of an insect. Lang also learns that it belongs to Dr. Hank Pym (Michael Douglas), a wealthy inventor who’s been surveilling Lang ever since Lang’s Robin Hood-type crimes against his former employer, Vistacorp, made the news. In fact, Pym orchestrated the heist in a plot to lure Lang and see if he has the mettle to carry on the super-heroics that Pym started long ago as Ant-Man, much to the dismay of his ready and able estranged daughter Hope Van Dyne (Evangeline Lily). Lang strikes a deal with Pym, who requires Lang’s thieving talents to break into Pym Industries in order to steal the Yellowjacket suit, designed by former protegé, Darren Cross (Corey Stoll), a weaponized variation of the Ant-Man tech using Pym Particles he aims to sell to the highest (cough**HYRDA**cough) bidder. In return, Lang won’t ever have to worry about providing for his daughter, but it will first require getting accustomed to the suit and learning how to communicating with the variations of ants at Ant-Man’s disposal, before he can take on an egomaniac like Cross. Up until now, Marvel Studios movies have been action flicks first and foremost with flares of soap opera drama, political undertones and varying degrees of humor injected for levity. “Ant-Man” is intentionally the opposite, putting humor at the heart of a heist thriller. That’s welcome. When you think about a hero that’s basically a shrinking man (with the proportionate strength of an ant – what? they’re strong! ), who has the ability to influence ants as well as blow anyone/thing up to enormous sizes – well, it kind of has to either be really funny or really weird. Unfortunately, the movie’s narrative hits so many recognizable beats – familiar to movies in general, not just superhero movies – that it provides very little surprises. I was kind of hoping that “Ant-Man” would deliver some weird and wacky humor over the predictable laughs it offers. It also would’ve made sense to have more scenes where we see Lang in shock or getting used to the changes this his newfound “abilities” bring. It would’ve provided more of a wow factor when Lang’s Ant-Man is discovering his big new world, instead of the recycling of “Honey, I Shrunk the Kids” we get. There was potential, but it all just feels safe. 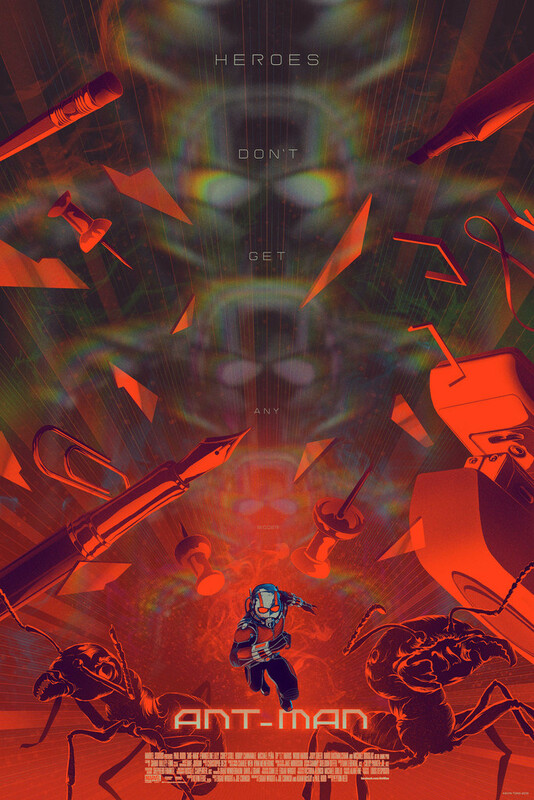 It makes me believe that at one-time, when writer/director Edgar Wright (“Shaun of the Dead” and “Scott Pilgrim versus the World”) was at the helm with co-writer Joe Cornish (director of “Attack the Block”), there was an “Ant-Man” movie that was more creative, offering something riskier than the Marvel mold Reed has hired to create – especially since Wright cited “creative differences” as his reason for departure. Even though Wright and Cornish are given screenwriting credit, “Ant-Man” still feels like the forced laughs, heavy exposition and routine conventions (like unimaginative training montages) were concocted by “Anchorman” and “Talledega Nights” scribe Adam McKay and his pal, Paul Rudd – both of whom also received screenwriting credits. While it’s hard to watch “Ant-Man” and not think where the movie could’ve gone, I still had fun watching everything unfold in IMAX 3D – at least that’s what I want to take with me. Certain scenes that shouldn’t work – like an opening in 1989 at S.H.I.E.L.D.’s Triskelion (geek speak for “headquarters”) where we see a CGI’d actor made to look like a “War of the Roses” era Michael Douglas (he looks better than 80s Jeff Bridges did in “Tron Legacy”) – succeed, because it broadens the Marvel Cinematic Universe (MCU) with reprising roles for Howard Stark (John Slattery “Iron Man 2”) and the always welcome Peggy Carter (Hayley Atwell, in aging make-up that makes Younger Hank Pym look like a wax figure). It’s an opening that gives the MCU more history, while establishing how Pym fits (or retrofits) into the franchise world. There’s also certain action scenes that work – like when Ant-Man has to go thru an Avenger (Anthony Mackie on your right!) to get to a MacGuffin needed to complete the necessities for the heist – and some that don’t – like the unseen repercussions of a helicopter nose-diving into a populated residential area. But, whatever, right? This is another side of the MCU. In both “Avengers” and “Avengers: Age of Ultron” there were heroes dealing with collateral damage and civilian casualties, but “Ant-Man” looks at this superheroing from the perspective of a newbie seeking reconciliation with his daughter. 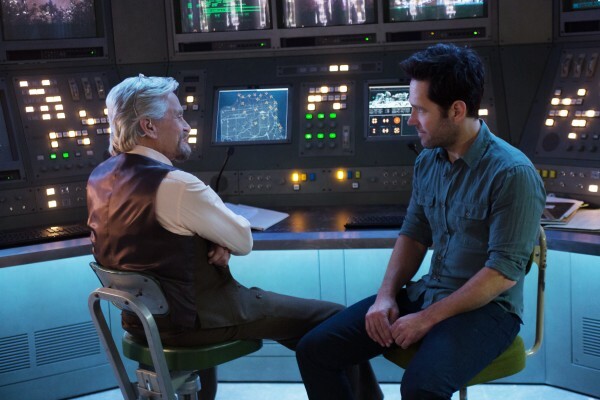 It’s actually dealing with two Ant-Man looking for such reconciliation, it’s just that Pym doesn’t realize how he’s been railroading his daughter until the movie’s third act. 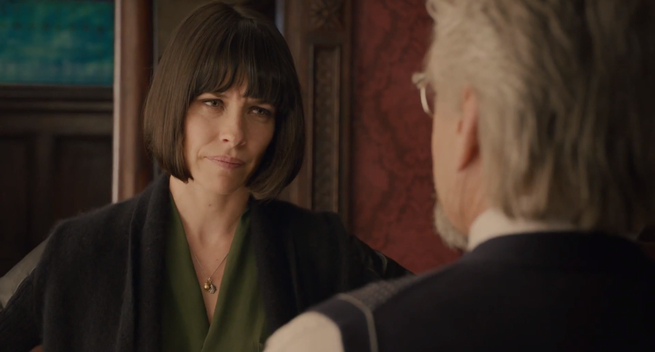 How Hope Van Dyne is portrayed is one of two poor characterizations in “Ant-Man”. Anyone familiar with the history of The Wasp (Janet Van Dyne, Ant-Man’s sidekick and occasional lover/wife in the comics, both of whom were founding members of the Avengers – again, in the comics), can clearly see that Evangeline Lily’s ‘bangs and bob’ hairdo is obviously resembles Janet – her mother in this movie (seen only in an action flashback, working alongside an even younger Pym, both helmeted, of course), but she remains an inactive presence. Despite Lang needing Hope to teach him how to throw a punch (because he obviously can’t hit like a girl), she is maligned by Pym and the screenwriters – only to be given an “it’s about damn time!” in the one (one of two) end credit stinger scenes that relates to the movie we just viewed instead of the ones to come. The other character that could’ve used a little development is the movie’s baddie. As Darren Cross, Corey Stall is a fine scorned protegé, but we never really see that he and Pym were at one time engaged in a true master and apprentice relationship. What we get instead is more a scorned rival – like Miguel Ferrer’s cocky executive to the senior boss played by Ronny Cox in the original “RoboCop” – instead of an established connection. If that were there, Cross’ intentions would’ve hit Pym on a more emotional level, rather than Pym just getting ticked off that his invention is being used as a weapon. Ultimately, Cross winds up like so many villains in superhero movies, like Iron Monger in “Iron Man” and Green Goblin in Raimi’s “Spider-Man” movies. They started out as suits with dubious motives and suit-up in the third act to duke it out with our hero. 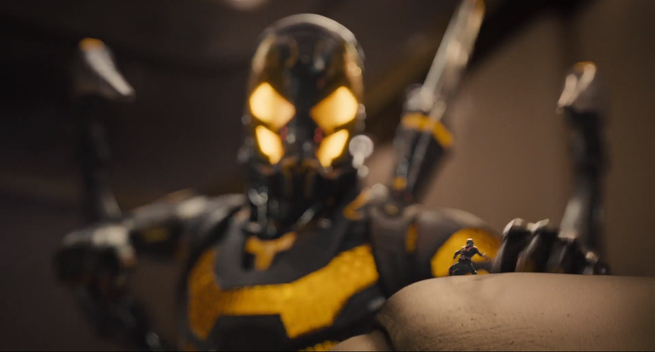 At least in this case, we get to see something new in the climactic good guy vs. bad guy fight, what with the two Ant-Man and Yellowjacket zapping back and forth from normal size to microscopic size. It makes the fight visually interesting and adds some legitimate chuckles as the two take their fight to Lang’s daughter’s toy train set in her bedroom. 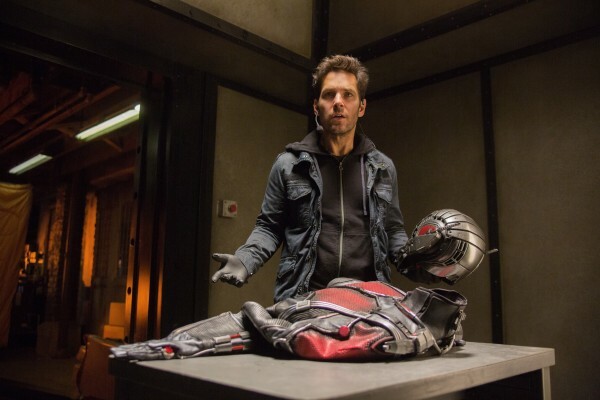 I’m down with more Paul Rudd as Ant-Man though, whether he shows up in a sequel or other Marvel movies (I could see the character going the way of the Hulk – who really doesn’t need more solo movies and is better suited in team movies). He brings more charm than smarm and for that I am thankful. We already have RDJ’s Tony Stark, thank you. Next time though I’d like to see more of Lang’s MacGuyer-type resourcefulness in use, allowing the character to usefully combine his cerebral prowess with his super-powered suit. As mentioned, I saw “Ant-Man” in IMAX 3D. Is it necessary? Nah, but it’s cool and as you’d expect the bigger-than-life quality of the microscopic world lends well to the 3rd dimension. Except for some language (hardly keeps phases the MPAA), this is an entertaining (minor) superhero entry in the MCU – a nice break before everything gets nuts again next May with “Captain America: Civil War”.